You know Gonzo and U-Bahn, but who’s Moth? Doctor Who is back! And thanks to the BBC shifting it to Sunday nights in the UK, it’s now screening here Monday evenings before the ABC news, which is… actually a good time for the new series, aimed as it is at winning back the younger audience that has been drifting away over the last few years. Of course, the ABC would much prefer to be showing it Sunday nights in prime time – Doctor Who is pretty much the only BBC program that the ABC still has first-run rights to, with most of the UK broadcaster’s output now going directly to their pay TV channel BBC First – but Who fans aren’t really the type to wait close to a full week before watching the latest episode. And while piracy seems to be pretty much a dead issue these days, that’s almost entirely because every network with any sense is getting the shows people want to watch in front of audiences before they can get around to stealing them. So somewhat ironically, Doctor Who in Australia now has a timeslot that less people watch just at a time when the show is unashamedly trying to maximise its audience. 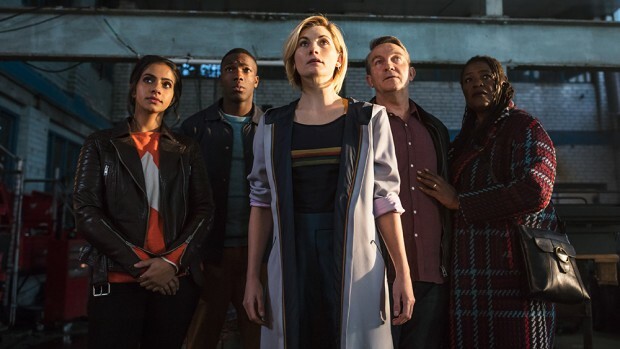 Fortunately, while some viewers (myself included) had some misgivings about the overall direction of the new series, Jodie Whittaker as the thirteenth Doctor seems to have (rightfully) won over all the (very small number of) nay-sayers with a performance that does everything right as far as a version of Doctor Who that everyone can enjoy. It’s a truism that any long running series or character will eventually go on long enough that no one version can please everyone; If you’re a massive fan of the Roger Moore James Bonds you’re probably not all that into much of Daniel Craig’s work, and if you loved the 1966 version of Batman then The Dark Knight Rises most likely doesn’t scratch the same itch. Doctor Who largely gets around this by making the various Doctors clearly separate from each other; you’re not going to be confusing Tom Baker’s version with anyone else’s, even if there are certain characteristics we expect the various Doctors to share. So while Peter Capaldi’s previous Doctor was largely sold as a “back to basics” model taken from the original series – older man, not hunkily attractive, playing a slightly cranky version of the character – Whittaker’s version, even after only a handful of episodes, is clearly equally “back to basics”… only now the new status quo is that of the new series where the Doctor is a youthful, bubbly, very attractive friend to the various traditional human companions. It’s a perfectly valid approach, and a sensible one for a show looking to recapture past glories: the only problem with this is that if every Doctor is going to be basically the same, then the advantage of being able to change the lead actor is lost. Whereas in the past the show has largely gone for a “hire the most charismatic performer available and tailor the character to their strengths” approach, it feels like from here on in the performer will have to fit an increasingly restrictive mould. And if that’s the case, some of what made Doctor Who such a special show to watch will be gone.